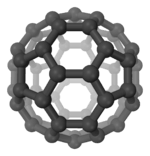 , also known as heavy hydrogen) is one of two stable isotopes of hydrogen. The nucleus of deuterium, called a deuteron, contains one proton and one neutron, whereas the far more common hydrogen isotope, protium, has no neutron in the nucleus. Deuterium has a natural abundance in Earth's oceans of about one atom in 7003642000000000000♠6420 of hydrogen. Thus deuterium accounts for approximately 0.0156% (or on a mass basis 0.0312%) of all the naturally occurring hydrogen in the oceans, while the most common isotope (hydrogen-1 or protium) accounts for more than 99.98%. The abundance of deuterium changes slightly from one kind of natural water to another (see Vienna Standard Mean Ocean Water). The deuterium isotope's name is formed from the Greek deuteros meaning "second", to denote the two particles composing the nucleus. 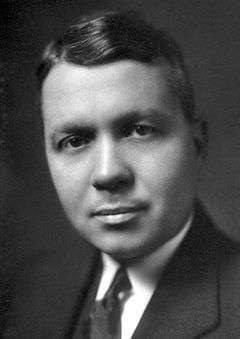 Deuterium was discovered and named in 1931 by Harold Urey. When the neutron was discovered in 1932, this made the nuclear structure of deuterium obvious, and Urey won the Nobel Prize in 1934. Soon after deuterium's discovery, Urey and others produced samples of "heavy water" in which the deuterium content had been highly concentrated. Deuterium is destroyed in the interiors of stars faster than it is produced. Other natural processes are thought to produce only an insignificant amount of deuterium. Nearly all deuterium found in nature was produced in the Big Bang 13.8 billion years ago, as the basic or primordial ratio of hydrogen-1 (protium) to deuterium (about 26 atoms of deuterium per million hydrogen atoms) has its origin from that time. This is the ratio found in the gas giant planets, such as Jupiter (see references 2,3 and 4). However, other astronomical bodies are found to have different ratios of deuterium to hydrogen-1. This is thought to be as a result of natural isotope separation processes that occur from solar heating of ices in comets. Like the water-cycle in Earth's weather, such heating processes may enrich deuterium with respect to protium. The analysis of deuterium/protium ratios in comets found results very similar to the mean ratio in Earth's oceans (156 atoms of deuterium per million hydrogens). This reinforces theories that much of Earth's ocean water is of cometary origin. The deuterium/protium ratio of the comet 67P/Churyumov-Gerasimenko, as measured by the Rosetta space probe, is about three times that of earth water. This figure is the highest yet measured in a comet. The reduced mass of the system in these equations is close to the mass of a single electron, but differs from it by a small amount about equal to the ratio of mass of the electron to the atomic nucleus. For hydrogen, this amount is about 1837/1836, or 1.000545, and for deuterium it is even smaller: 3671/3670, or 1.0002725. The energies of spectroscopic lines for deuterium and light-hydrogen (hydrogen-1) therefore differ by the ratios of these two numbers, which is 1.000272. 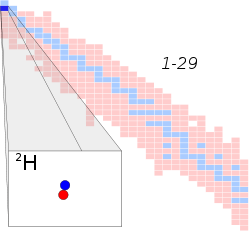 The wavelengths of all deuterium spectroscopic lines are shorter than the corresponding lines of light hydrogen, by a factor of 1.000272. In astronomical observation, this corresponds to a blue Doppler shift of 0.000272 times the speed of light, or 81.6 km/s. The differences are much more pronounced in vibrational spectroscopy such as infrared spectroscopy and Raman spectroscopy, and in rotational spectra such as microwave spectroscopy because the reduced mass of the deuterium is markedly higher than that of protium. Through much of the few minutes after the big bang during which nucleosynthesis could have occurred, the temperature was high enough that the mean energy per particle was greater than the binding energy of weakly bound deuterium; therefore any deuterium that was formed was immediately destroyed. This situation is known as the deuterium bottleneck. The bottleneck delayed formation of any helium-4 until the universe became cool enough to form deuterium (at about a temperature equivalent to 100 keV). At this point, there was a sudden burst of element formation (first deuterium, which immediately fused to helium). However, very shortly thereafter, at twenty minutes after the Big Bang, the universe became too cool for any further nuclear fusion and nucleosynthesis to occur. At this point, the elemental abundances were nearly fixed, with the only change as some of the radioactive products of big bang nucleosynthesis (such as tritium) decay. The deuterium bottleneck in the formation of helium, together with the lack of stable ways for helium to combine with hydrogen or with itself (there are no stable nuclei with mass numbers of five or eight) meant that insignificant carbon, or any elements heavier than carbon, formed in the Big Bang. These elements thus required formation in stars. At the same time, the failure of much nucleogenesis during the Big Bang ensured that there would be plenty of hydrogen in the later universe available to form long-lived stars, such as our Sun. The existence of deuterium on Earth, elsewhere in the solar system (as confirmed by planetary probes), and in the spectra of stars, is also an important datum in cosmology. Gamma radiation from ordinary nuclear fusion dissociates deuterium into protons and neutrons, and there are no known natural processes other than the Big Bang nucleosynthesis, which might have produced deuterium at anything close to the observed natural abundance of deuterium (deuterium is produced by the rare cluster decay, and occasional absorption of naturally occurring neutrons by light hydrogen, but these are trivial sources). There is thought to be little deuterium in the interior of the Sun and other stars, as at temperatures there nuclear fusion reactions that consume deuterium happen much faster than the proton-proton reaction that creates deuterium. However, deuterium persists in the outer solar atmosphere at roughly the same concentration as in Jupiter, and this has probably been unchanged since the origin of the Solar System. The natural abundance of deuterium seems to be a very similar fraction of hydrogen, wherever hydrogen is found, unless there are obvious processes at work that concentrate it. Cometary bodies such as Comet Hale Bopp and Halley's Comet have been measured to contain relatively more deuterium (about 200 atoms D per million hydrogens), ratios which are enriched with respect to the presumed protosolar nebula ratio, probably due to heating, and which are similar to the ratios found in Earth seawater. The recent measurement of deuterium amounts of 161 atoms D per million hydrogen in Comet 103P/Hartley (a former Kuiper belt object), a ratio almost exactly that in Earth's oceans, emphasizes the theory that Earth's surface water may be largely comet-derived. Most recently the deuterium/protium (D/H) ratio of 67P/Churyumov-Gerasimenko as measured by Rosetta is about three times that of earth water, a figure that is high. This has caused renewed interest in suggestions that Earth's water may be partly of asteroidal origin. Deuterium can replace the normal hydrogen in water molecules to form heavy water (D2O), which is about 10.6% denser than normal water (so that ice made from it sinks in ordinary water). Heavy water is slightly toxic in eukaryotic animals, with 25% substitution of the body water causing cell division problems and sterility, and 50% substitution causing death by cytotoxic syndrome (bone marrow failure and gastrointestinal lining failure). Prokaryotic organisms, however, can survive and grow in pure heavy water, though they develop slowly. Despite this toxicity, consumption of heavy water under normal circumstances does not pose a health threat to humans. It is estimated that a 7001700000000000000♠70 kg person might drink 4.8 liters of heavy water without serious consequences. Small doses of heavy water (a few grams in humans, containing an amount of deuterium comparable to that normally present in the body) are routinely used as harmless metabolic tracers in humans and animals. and thus consists of three types of nuclei, which are supposed to be symmetric: a deuterium nucleus (actually a highly excited state of it), a nucleus with two protons, and a nucleus with two neutrons. The latter two nuclei are not stable or nearly stable, and therefore so is this type of deuterium (meaning that it is indeed a highly excited state of deuterium). The natural deuterium content of water has been suggested from preliminary correlative epidemiology to influence the incidence of affective disorder-related pathophysiology and major depression, which might be mediated by the serotonergic mechanisms. The existence of nonradioactive isotopes of lighter elements had been suspected in studies of neon as early as 1913, and proven by mass spectrometry of light elements in 1920. The prevailing theory at the time, however, was that the isotopes were due to the existence of differing numbers of "nuclear electrons" in different atoms of an element. It was expected that hydrogen, with a measured average atomic mass very close to 7000100000000000000♠1 u, the known mass of the proton, always had a nucleus composed of a single proton (a known particle), and therefore could not contain any nuclear electrons without losing its charge entirely. Thus, hydrogen could have no heavy isotopes. Urey created the names protium, deuterium, and tritium in an article published in 1934. The name is based in part on advice from G. N. Lewis who had proposed the name "deutium". The name is derived from the Greek deuteros (second), and the nucleus to be called "deuteron" or "deuton". Isotopes and new elements were traditionally given the name that their discoverer decided. Some British chemists, like Ernest Rutherford, wanted the isotope to be called "diplogen", from the Greek diploos (double), and the nucleus to be called diplon. After World War II ended, the Allies discovered that Germany was not putting as much serious effort into the program as had been previously thought. They had been unable to sustain a chain reaction. The Germans had completed only a small, partly built experimental reactor (which had been hidden away). By the end of the war, the Germans did not even have a fifth of the amount of heavy water needed to run the reactor, partially due to the Norwegian heavy water sabotage operation. However, even had the Germans succeeded in getting a reactor operational (as the U.S. did with a graphite reactor in late 1942), they would still have been at least several years away from development of an atomic bomb with maximal effort. 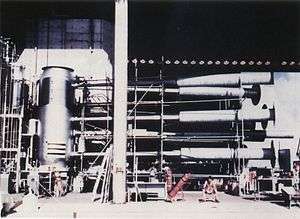 The engineering process, even with maximal effort and funding, required about two and a half years (from first critical reactor to bomb) in both the U.S. and U.S.S.R, for example. 1 2 3 O'Leary, Dan (2012). "The deeds to deuterium". Nature Chemistry. 4: 236. doi:10.1038/nchem.1273. ↑ "§ IR-3.3.2 Provisional Recommendations". Nomenclature of Inorganic Chemistry. Chemical Nomenclature and Structure Representation Division, IUPAC. Retrieved 2007-10-03. ↑ graph of deuterium with distance in our galactic neighborhood See also Linsky, J. L.; Draine, B. T.; Moos, H. W.; Jenkins, E. B.; Wood, B. E.; Oliviera, C.; Blair, W. P.; Friedman, S. D.; Knauth, D.; Lehner, N.; Redfield, S.; Shull, J. M.; Sonneborn, G.; Williger, G. M. (2006). "What is the Total Deuterium Abundance in the Local Galactic Disk?". The Astrophysical Journal. 647: 1106–1124. arXiv:astro-ph/0608308 . Bibcode:2006ApJ...647.1106L. doi:10.1086/505556. ↑ Lellouch, E; Bézard, B.; Fouchet, T.; Feuchtgruber, H.; Encrenaz, T.; De Graauw, T. (2001). "The deuterium abundance in Jupiter and Saturn from ISO-SWS observations". Astronomy & Astrophysics. 670 (2): 610–622. Bibcode:2001A&A...370..610L. doi:10.1051/0004-6361:20010259. ↑ "Pharmacological uses and perspectives of heavy water and deuterated compounds". Can. J. Physiol. Pharmacol. 77 (2): 79–88. 1999. doi:10.1139/cjpp-77-2-79. PMID 10535697. ↑ Pohl, Randolf; Nez, François; Fernandes, Luis M. P.; et al. (12 August 2016). 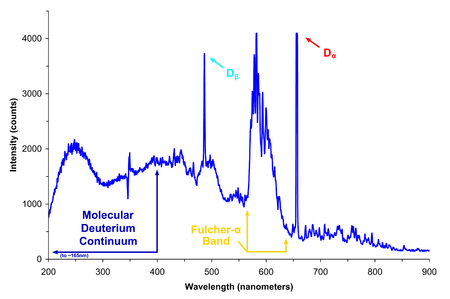 "Laser spectroscopy of muonic deuterium". Science. 353 (6300): 669–673. doi:10.1126/science.aaf2468. ↑ Hobson, KA; Van Wilgenburg, SL; Wassenaar, LI; Larson, K (2012). "Linking Hydrogen (δ2H) Isotopes in Feathers and Precipitation: Sources of Variance and Consequences for Assignment to Isoscapes.". PLOS ONE. 7 (4): e35137. Bibcode:2012PLoSO...735137H. doi:10.1371/journal.pone.0035137. ↑ Strekalova T.; Evans M.; et al. (2014). "Deuterium content of water increases depression susceptibility: The potential role of a serotonin-related mechanism.". Behavioural Brain Research. 277: 237–44. doi:10.1016/j.bbr.2014.07.039. PMID 25092571. ↑ Urey, Harold; Brickwedde, F.; Murphy, G. (1932). "A Hydrogen Isotope of Mass 2". Physical Review. 39: 164–165. Bibcode:1932PhRv...39..164U. doi:10.1103/PhysRev.39.164. ↑ Massam, T; Muller, Th. ; Righini, B.; Schneegans, M.; Zichichi, A. (1965). "Experimental observation of antideuteron production". Il Nuovo Cimento. 39: 10–14. Bibcode:1965NCimS..39...10M. doi:10.1007/BF02814251. ↑ Chardonnet, P; Orloff, Jean; Salati, Pierre (1997). "The production of anti-matter in our galaxy". Physics Letters B. 409: 313–320. arXiv:astro-ph/9705110 . Bibcode:1997PhLB..409..313C. doi:10.1016/S0370-2693(97)00870-8. Mullins, Justin (27 April 2005). "Desktop nuclear fusion demonstrated with deuterium gas". New Scientist. Retrieved 2007-09-10.